The first installation of this kind. Four pallets of hard burned clinker bricks (4x320 = 1280 bricks) were piled up within a glasshouse shared with four other artists (Kirkeby, Pernice, Weber). A quarter of the bricks were first cut in half. The brick (Wienerberger Kanalklinker 20512) is the same as used in "First Chimney II" in Frankfurt in April 2013. In "First Chimney II" the wall is one and a half stone deep. 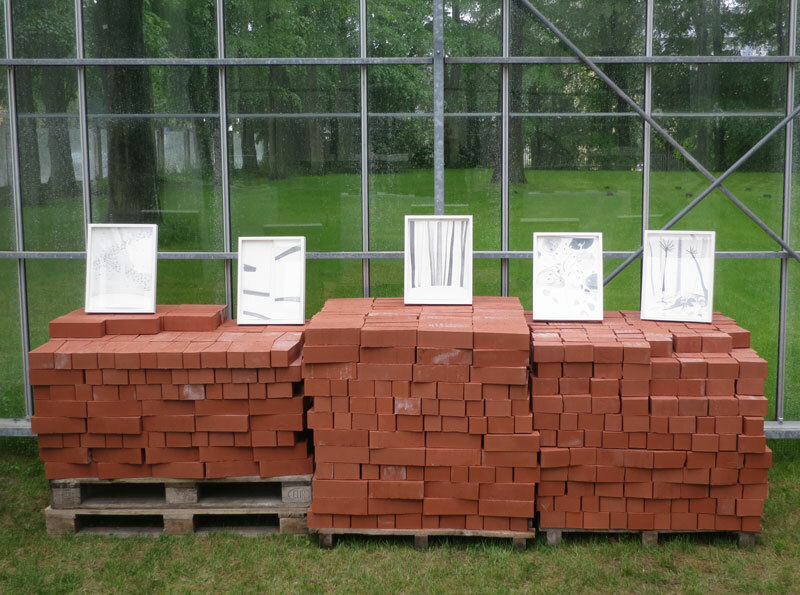 On top of the brick piles: five new Chimney Drawings, made for the occasion. Click on the drawings for details.